So I'm in DC this week for the Milken Educator Awards and since Tiffany was not able to come I took my friend Chris. Today, while I was learning all about the Milken Family Foundation and what all of these cool teachers do, Chris was tromping around our nations capital... He went to the Botanical Graden near the Capital Building and on his tour saw this flower.... The Madagascar Periwinkle. What you are looking at here in this picture is most likely the reason Abby, and so many other Leukemia kids are still with us! Vincristine is made from this flower. The even crazier part of this is that Chris learned from the guide that Vincristine can't be synthesized. It can only be extracted from this plant! Crazy! 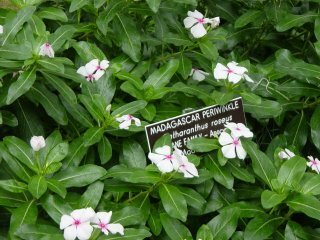 Here is a little blurb from a site I found on the web talking about this flower and it's cancer fighting compounds, "...more recently, 2 alkaloids in Madagascar Periwinkle leaves, vinblastine and vincristine, were identified as active anti-cancer agents that could be used in chemotherapy. Vinblastine is used for patients with Hodgkin’s disease and vincristine is used for children with leukemia. With the introduction of vincristine, the survival rate for children with leukemia jumped from 20 to 80 percent." From 2o... to 80 percent... Wow! You can read more about it here. So anyway, there is your fact for the day. Don't just be looking at pretty flowers anymore, they might just be one the you could fix your aching back with... or at least your kid with A.L.L.!!! Well, back to the conferance... you can check out more about the conference and how the week is going on the conference blog found at this site.